by Northland Gel Ice, Inc. The Pillows'96 Keyboard Wrist Pillow is designed to reduce tension, muscle aches, stiffness and fatigue that can be associated with extended keyboard use. If you are someone who experiences cold hands and needs to warm them then this may be a choice for you. The unique filling of the Wrist Pillow permits it to be warmed with a microwave, offering cold hands that extra warmth they need. On the other hand, If you need to cool it down a few minutes in a fridge or freezer will provide cool relief. 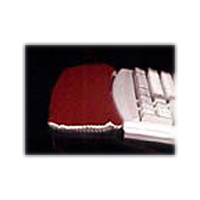 Softer and more pliable then gel, this palmrest conforms more readily, reducing potential pressure points. A soft fabric surface provides a comfortable rest for the hand and the grip surface underside will keep it in place as required. At 18" wide by 3.25" deep this will fit most keyboards and trays.